MESSIAH'S BRANCH Ministries and International Radio: Prophecy Hour - End Time Radio By Messiah's Branch - PROPHECY HOUR:THE CERN HADRON COLLIDER, DOOR FOR DEMONS? Prophecy Hour - End Time Radio By Messiah's Branch - PROPHECY HOUR:THE CERN HADRON COLLIDER, DOOR FOR DEMONS? 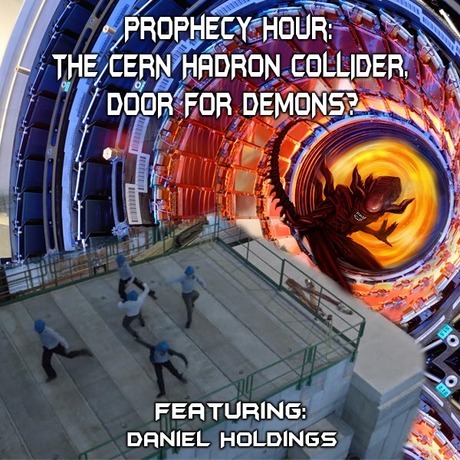 PROPHECY HOUR:THE CERN HADRON COLLIDER, DOOR FOR DEMONS? The Large Hadron Collider yes let's look at some of the results of CERN, or, results that are associated with CERN. First of all, it appears that neutrinos have mass after all and can open up portals to other dimensions. It has been reported that beings from other dimensions actually appeared just prior to the shutting down of CERN in 2012. At that time, the collider was running at 7 TeV (tetraelectonvolts) ("T" stands for "trillion."). Despite the consternation this caused, the collider is now, in 2015, revving particles up with a more powerful booster and will start colliding at 13 TeV.